Springs have played a major cultural, historical, ecological, and spiritual role in shaping Texas. Springs in the state are as varied and unique as the landscape, and are an important resource for all Texans. Many springs have disappeared and the quality, integrity, and existence of many more are threatened. 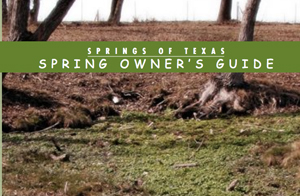 The intent of this guide is to increase awareness of the importance of springs and to assist spring owners in taking steps to care for their springs.